More than 35 years of experience getting to know the needs of our customers allows us to understand power problems better than other providers, and to quickly design/deliver solutions specifically tailored to solve your engineering challenges. Bat Con TEST , Main Fail and Bat Sys Alarms. LVD ( Low Voltage Disconnect). 2 x ICT103048-5AI2 190W 11-30/48VDC. Input Voltages from 11 – 30VDC. DC distribution: 4 x 2A MCB’s. Equipped with a P50 Blocking diode for redundancy applications. Digital V/I meter monitors the output of the charger. Auxiliary , Mains Fail , Battery Low alarms with voltage free contacts. 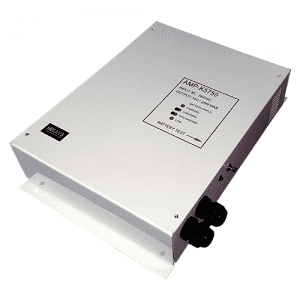 AC/DC 650W power supply. Provides a number of outputs via special Lemo connectors on rear panel. A number of LED’S on the front panel provide visual indication of all outputs, together with special DC filtering. This special battery charger was designed for use in remote areas in the Pacific powering special scientific instruments. Input is 36-75VDC and output 13.8 VDC 50W charging a battery for stand-by power. 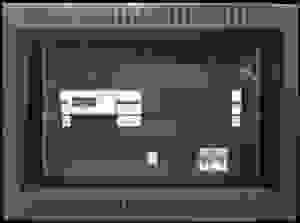 A number of digital meters provide user with critical information and all connections are on special MIL-SPEC connectors. Designed to customer specifications for the mining industry, this comprises of three separate 3U x 19in Rack power supplies. The AC/DC unit provides 24V 35A for battery charging. 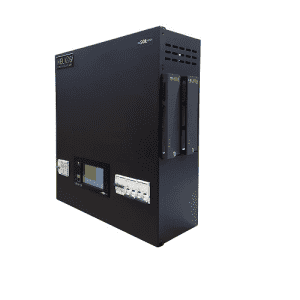 The DC/DC unit provides 24/48V 500 watts and , together with a Remote Monitoring unit. Power Supply Output set to 48 VDC. 3X5A MCB’s load outputs with frontal access. Is it space your main concern? Wall-Mounted Charging Rectifiers Systems are you best solution. 2.2kW 110 VDC float Charger. Two 1.1kW Hot Swappable rectifiers. 32A 2 pole Battery Breaker monitored by the system. DC High, Battery Low, AC Mains High/Low, Rectifier Fail, System Major Earth Fault and Controller Fail Programmable alarms on voltage free relay contacts. 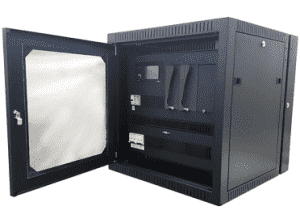 SEC-SR wall mount cabinet with dimensions 405H x 444W x 273D mm. 24V DC Input terminals for redundant applications. Mains Fail, DC Low and Tamper alarms in the form of voltage free contacts. 6A 1P Mains Input MCB. Mains Fail, DC High, DC Low, System DC Low and General Alarm on voltage free relay contacts. 125VDC up to 2.2kW Single Phase Wall Mount. Can be used as stand-alone power supply without batteries. Single phase surge protection incorporated. Common Form C alarm relay contacts (6). 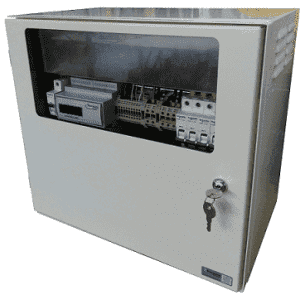 Using marine grade aluminium to protect from corrosion, our pole mounted enclosures are engineered to accommodate electrical powering equipment, racked in a pole mount configuration. 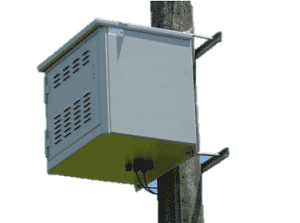 Our custom designed pole mount solutions can be made to suit your requirements and can either house batteries inside the cabinet, or for a more compact solution can house batteries separately in an underground box. With Helios Power Solutions the ability to customise is always an option, ensuring our products meet your every specification, in turn providing a robust reliable and proven solution. DC Distribution with 1 x 10A and 3 x 4A MCB’s. 30VDC 250W redundant charger in 2U rack. A 24VDC distribution of 2 x 2A 2P and 3 x 6A 2P MCB’s. A 30VDC distribution of 1 x 20A 2P and 4 x 6A 2P MCB’s. 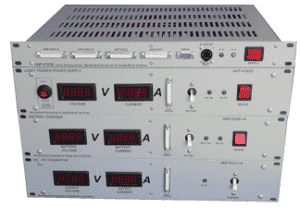 Two digital V/I meters and two alarm cards monitoring the 24VDC and 30VDC output voltages. Two battery shelf housing the 24VDC and 30VDC battery banks. DC High, Mains Fail and DC Low alarms for each rectifier. DC High, DC Low and Earth fault alarms for the 24VDC system and a second set for the 30VDC system. Combined Major and System Fail alarms with voltage free contacts. Internal 108V 105Ah battery bank protected with a 40A 2P MCB. DC Distribution with 4 x 2P 20A and 1 x 2P 10A breakers. Remote monitoring and programming with a webpage interface. 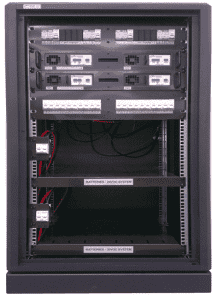 38U floor mount 19” cabinet. DC Distribution with 12 x 10A 2P MCB’s. Remote control with MODBUS and SNMP. Hot Swappable convection cooled rectifiers. Mains Fail, DC Low, DC High and General System alarms.